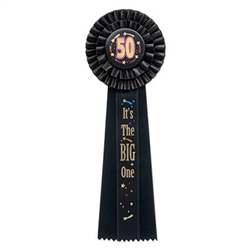 Fifty is a big birthday milestone so celebrate with an equally as big accessory with 50 It’s The Big One Deluxe Rosette Ribbon. Measuring at (13) inches in length and (4 ¼) inches across including the button and two pleated borders around it, this deluxe rosette ribbon will surely attract attention to the birthday girl or boy. Despite being done in black satin material, 50 It’s The Big One Deluxe Rosette Ribbon has multiple accent details. The outer layer of pleated border consists of a golden edge. The center button comprise of gold prismatic “50” that is surrounded by gold shooting stars. The final touch is the center strip of (9) inch ribbon dangling which has “It’s The Big One” printed in gold. Extra details means extra attention so soak it all in on your big day and wear 50 It’s The Big One Deluxe Rosette Ribbon. Very nice quality ribbon and did not fall apart either like some others do.